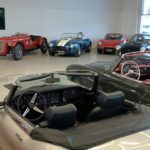 Services – Triangle Motor Co.
Next classic car auction 11.5.2019! The restoration of an old vehicle is neither cheap nor easy. The job takes its time, and not everyone can do it. To restore a vehicle takes skill and thoroughness. The restorer must respect his job. We have these basic things in order. Our experienced staff has the best possible professional skills and high motivation. We have found suppliers, who can satisfy our call for quality. 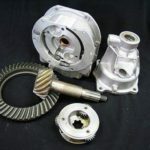 Triangle Motor Co. can carry out even the most demanding restoration and repair jobs. 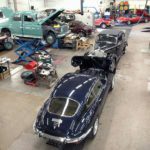 Triangle Motor Co. is the leading Finnish classic car restorer. We have a long experience of all kinds of cars and can do partial or total restorations. We have specialized in Jaguars, but no car is strange to us. Most operations of the restoration is done in our own workshops. This is how we can quarantee the exellent quality of our work. We are familiar with modified and hi-performance cars. We build, tune and repair cars also for racing. Technical updates are common in muscle cars to make them even more powerful. We also update classic cars with modern components to make them more safe and comfortable while retaining the spirit of the original. Dream cars are made by combining the best from the past and present. Feel free to ask if you want more information. We are here to make your car even better! We service and repair all classic cars. We have specialized in Jaguars, but no car is strange to us. Our experienced mechanics can repair various faults and make all necessary adjustments in our well equipped garage. Accessory installations are also provided. Modifications are taken care from planning to inspected ready-to-go vehicle. 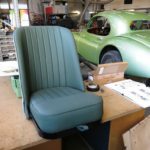 Car seats, interior and trunk upholstery can be done in Triangle Motor Co. The customer can choose the materials and design to be used. We have wide range of upholstery materials from originals to more luxurious and special ones. It’s also possible to fabricte and install soft tops. The quality of our upholstery work is extremely high. In our body shop we do crash and rust repairs as well as body modifications and customization. Chassis and frame straightening are also provided. When body panels need to be replaced we use good quality ones. When they are not available they are made by hand. Even the most complex body panels cal be fabricated by hand. Wood is relatively common material in classic cars. Most pre-war cars have wooden chassis. We do repair and restore those wooden parts also. Wooden parts are fabricated by hand right next to the body shop. 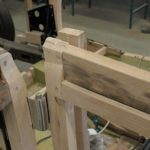 Nails, screws and the specific species of wood are chosen individually by each car to make it right. We also renovate and repair the wooden interior parts such as dashboards and trim panels. We can also fabricate new ones if necessary. 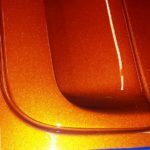 Many kinds of paintwork can be done from small spot repair to complete color changing re-paint. Even challenging special paintwork can be done. 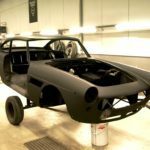 In total restoration projects all parts of the vehicle are painted separately. Flawless chrome parts finalize the vehicle. 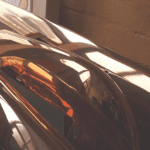 We offer top quality chroming service. The chroming is not done by us but we have a subcontractor to fit our high quality demands. 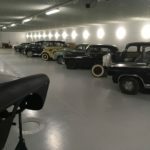 Do you need a winter storage for your car? Please contact us, if you need a high quality storage for your car. Our storage is located in Alastaro and we can also transport your car if needed. Prices starting from 85 € / month (including VAT). We have wide range of classic Jaguar parts available. Spare parts delivered weekly for all Jaguars. Rare and used parts are also available for several other cars. 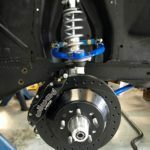 Tuning and performance upgrade parts and accessories for British and American cars. We buy and sell cars. We are able to acquire your dream car through our partners. Due to our contacts we are also able to buy cars that are not on public sale. 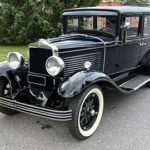 Check our list of cars for sale. If your dream car is not on the list at the moment, please contact to tell us what kind of vehicle you would like. We can arrange objective certified inspection for the car before purchase. In Europe the inspection can be done by Classic Data. We are looking for the following cars for our customers: Audi Quattro, BMW M1, BMW 3,0 & 2,5 Cs & Csi, BMW 850 Csi & M, Fiat Dino Spyder, Bugatti EB 110, Ferrari F 40, Ferrari Testarossa, Ferrari 512 Berlinetta Boxer, Ferrari 308 ja 328 GTB, Ferrari 550 Maranello, Jaguar E-Type Coupe Series 1, Jaguar E-Type Roadster Series 1, Lancia Delta Integrale, Mercedes-Benz 190 SL, Volkswagen Samba BUS. We are also interested all classic Lancias, Maseratis, Alfa-Romeos, Lamborghinis etc.